Since 1996, the World Unity Flag has been passed from person to person, It is co-creative symbol and concept representing our inherent unity – the interconnectedness and interdependence of All Life. Introduced and offered to the world community in the Spring of 1996 at an international environmental law conference “From Evolution to Enforcement,” which took place at the University of Victoria in British Columbia Canada. The World Unity Flag is neither political nor religious, it is inclusive and devoid of any specific affiliation… Offered to the World Community as a recognizable “unifying-symbol” to illustrate and promote awareness and appreciation of our world as a whole-system. The World Unity Flag flows freely and is shared by All. Like the air and water,flowing through the natural networks of our world community. To this aim, The Unity Flag continues to promote international unity as the means for us to work collaboratively and cooperatively in facilitating the strong binding agreements and cooperative strategies humanity needs to rapidly reverse greenhouse gas emissions and transition to a carbon neutral economy. 1996 International environmental law conference “From Evolution to Enforcement,” which took place at the University of Victoria in British Columbia Canada. ? Travelled from BC to Teotihuacan Pyramidas de Sol,(of the Sun and Moon…) de Luna(, near Mexico City, to attend 4 day ceremony with Runners and representatives from Indigenous nations from North, South and Central America, as well, attended International Indigenous People’s summit. Gathering At Ts’tumlalum, Nanoose Bay. 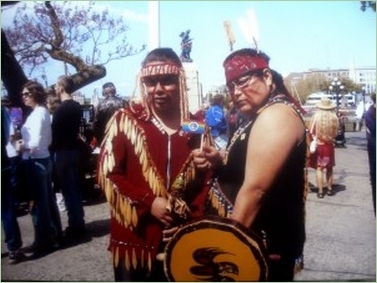 2002 - First Nations Environmental Network “Protecting Mother Earth Conference”, in Kamloops. 2003- Participated in V-Day rally, put on by Amnesty International which brought International attention to the plight of over 500 missing women in the Mexican city of Juarez. The march went from US city El Paso over the bridge to Juarez. Eve Ensler, Sally Field, Rosie Perez, and Jane Fonda participated in this huge rally, “Non Uno Mas! Not One more!” A small Unity Flag was placed on the touchingly beautiful Code Pink altar. Unity Flag toured with the One Love crew across the US to numerous festivals and cultural gatherings…most notably on tour brightening up the speakers on stage…with Michael Franti and Spearhead with visiting performing artist, Ziggy Marley.Unity Flag was made by approximately 800-1000 people, in Honour of his Holiness’s, the Dalai Lama’s visit to Vancouver. this flag was put forward in its intention publicly at a “Stop the War” gathering on Saltspring island, on March 13th – the 1 yr anniversary of the latest war/ invasion on Iraq. (No war is a “just “war. 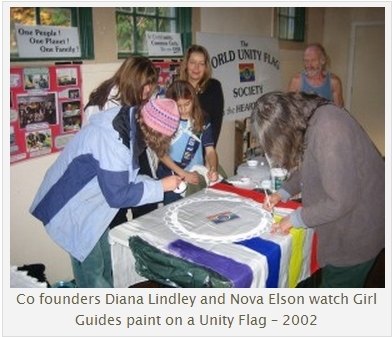 )The Unity Flag was first painted upon by over 100 youth representatives from 12 district 62# schools .This flag was also blessed at a conference on Sacred Waters, hosted by Cowichan First Nation representatives at the Simon Charlie foundation and Saanich First Nation elders. This Flag was also blessed and painted upon by many spiritual leaders and representatives from many diverse Faith groups at a Multi-Faith Summit, organized by the Vancouver Multi-Faith action Committee. An incredibly inspired and profoundly moving event, of such beauty mere words could not express. SER (Society for Earth Restoration) annual conference, where participants made a Unity flag approx 500 participants and was danced in by traditional First Nation dancers, visiting from the Cowichan Territories and passed to conference representaive from Sargosa, Spain to be taken there to proceeding events. A World Unity Flag (which was painted some two years prior by over 50 youth at an inclusive Leadership conference in honour of the 4th anniversary of the Earth Charter which traveled to Japan and Australia with, recording-artist Michael Franti and Spear Head,) was presented to Earth Charter co-founder, Chair-person of the Rio and Johannesburg Earth Summits, Maurice Strong. Traveled to Veracruz, Mexico for international YES Summit on Youth employment. Over 1200 youth leaders from over 100 countries were in attendance. CANDIL lecture hosted by the World Federalists which took place at UVIC on Canada, Democracy and international law. The World Unity Flag project went to Africa! A Flag was facilitated by, Rachelle Woldegiorgis, a young delegate from Toronto, Ontario, visiting Nairobi, Kenya to attend a large international summit on Youth Employment (see: www.yesweb.net ) and Afro Cities summit later in the month. This exciting event brought youth leaders from 120 different countries to share and discuss global issues. 2012 was hung above the Civicus both at the Civicus World Assembly Montreal Canada. Copyright 2014 Diana Lindley --. Awesome Inc. theme. Theme images by enot-poloskun. Powered by Blogger.